In search of powerful weapons to wield against the Storm Tyrant, the adventurers follow a map found in the lair of the hill giant Grenseldek, which leads them to the tomb of legendary giantslayer Nargrym Steelhand. Armed with these weapons of legend, the adventurers then head into the treacherous Mindspin Mountains in search of the valley where the Storm Tyrant is recruiting giants for his army. The heroes must sneak past the legions of giants inhabiting the winding valley before making their way to the horde's headquarters—an ancient temple dedicated to the giant god Minderhal. Once there, they must awaken a mighty artifact and disband the mustering army before the giants can be unleashed on the world! 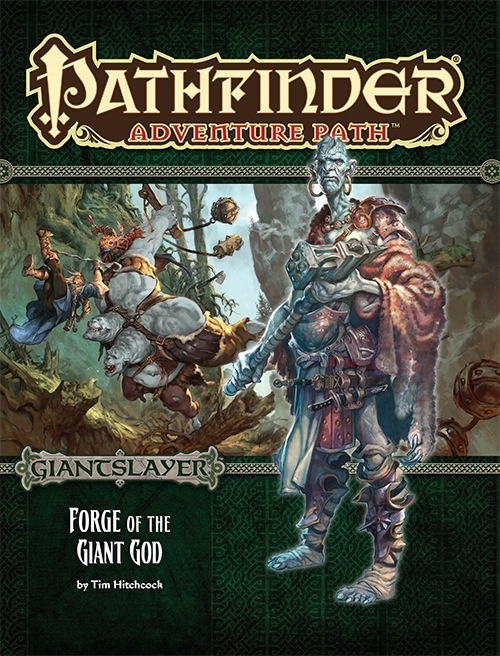 "Forge of the Giant God," a Pathfinder adventure for 7th-level characters, by Tim Hitchcock. A tale of escape and trickery in the Pathfinder's Journal, by Greg A. Vaughan. 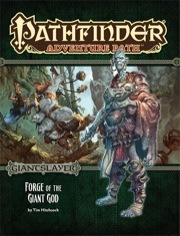 "Forge of the Giant God" is sanctioned for use in Pathfinder Society Organized Play. The rules for running this Adventure Path and Chronicle sheet are available as a free download (1.1 MB zip/PDF). See my full review on Of Dice and Pen. The adventure is a little too similar to the previous adventure, The Hill Giant’s Pledge, in that both involve sneaking into a similar giant-controlled location (and The Hill Giant’s Pledge does it better). Following up one adventure with another that does virtually the same thing runs the risk of making things stale for the players. However, there are things to make this adventure more unique, and good GMs should be able to make it into a memorable experience. Giantslayer continues to be decent enough adventure with some interesting set pieces, but a bit too uneven for me to highly recommend. This chapter did manage to somewhat improve upon the previous installments, with regards to combat balance. Unfortunately, it also seemed to lose ground with regards the overall intrigue of the main story. Probably my favorite part of this adventure is the first act. The PCs are able to uncover the tomb of a dwarven giantslayer. The dungeon has an interesting layout and a cool backstory. The giantslayer's betrayer being alive, trapped and cursed with immortality made for a memorable encounter. My players also enjoyed the magic items that were found in this dungeon, unlike some of the past artifacts, which were too specific to a class or religion for the party to actually use them. It was nice to see the giantslayer's items actually be useful towards giant slaying, as promised, instead of just being thrown into a pile of stuff to sell. It made the visit to the dungeon feel like a worthwhile detour. In the same vein, the sidequest to relight Minderhal's Forge was a fun inclusion for the players. The dungeons they had to go to in order to collect the items they needed were appropriately short and some of the more memorable locations in the adventure. Also, the forge itself was a great reward. The biggest issue I had with this chapter was the pacing. Part 2 of the adventure, where the PC explore the valley and search for the cathedral felt like it dragged. It made it feel like the bulk of the adventure was just fights with random groups of giants that were not overly challenging, due to the players almost always being full rested for each encounter. Comparatively, the last part of the adventure was very short and almost anticlimactic as a result. Once the PCs achieved the initial challenge of getting past the army of giants, the actual cathedral did not take very long to explore and complete. If not for the side quest to relight the forge (which sends the PCs right back to the valley) the book would have been over quite quickly. The side quest itself, while one of the more interesting parts of the adventure, also presents a challenge to pacing. It is awkward to place, since regardless of when it is done it disrupts from the main story line and if its skipped, your players are missing out on some of the better content in the game. I found that this quest, combined with the already long travel times in the valley, had the negative side effect of diminishing the players sense of urgency with the main plot line. Another issue with this adventure is that Urathash was not a very compelling main villain. There was nothing inherently wrong with him and he was a worthy foe from a mechanical perspective. However, he felt less fleshed out than the final bosses of the last two books. Skreed was a mysterious presence, whose cunning plans had to be uncovered by the PCs. Grenseldek's motives, while silly, offered a lot of context to the chaos and disorder of her fortress. Urathash comparatively felt like little more than an extra strong giant who just happened to have a name and be in charge. This book is also where the encounters started to feel more than a bit repetitive. Most of the fights are with groups of large melee heavy hitters. Not only is this a bit dull, but the predictability allow the PCs to become overly tailored towards such encounters and somewhat diminishes the overall challenge level of most of the non-boss encounters. To a degree, this flaw has to be forgiven, since the Adventure Path is named Giantslayer. Anyone who didn't want to fight a bunch of giants, certainly picked the wrong adventure. However, the past books felt like they managed to have a lot more encounter diversity. I also felt the giants themselves could have been more interesting to fight if their classes, weapons and tactics were more diverse. Instead it felt like half of the encounters were against some combination of trolls, ogres or hill giants, all fighting with either clubs or claws. While the encounter repetitiveness is somewhat excusable due to the limited number of CR appropriate giants, a less excusable form of repetitiveness was also found within the plot. The over arching plot is go to a secret place to find helpful items and then go to a fortified location and take out the leader, but avoid fighting the entire army. This is close to identical to the plot of the second book...and my players definitely noticed. This has me mildly concerned, since my peek ahead reveal that the fourth book sends the PCs on a very similar infiltration mission. The repetitive plot, combined with Urathash as an uninspiring villain and a somewhat lazy hook into the next book makes the main plot seem fair less interesting than the adventure's side quests, which featured better villains, locations, encounters, RP opportunities and items. Forge of the Giant God has a fun first act and is overall a functional adventure. It also has a couple nice treats in the form of loot that players will definitely enjoy, a good side quest. However, the overall adventure is somewhat unremarkable and has the unfortunate issue of having side quests that offer far more intrigue than the main story line. From this point onwards the PC:s are expected to go forward and stop a forming of giant army by themselves. Hopefully you have motivated your players to care enough about stopping this giant menace. First of all I like the crypt and the items you find there. They fit very well into this AP:s theme. The valley and all the places you can visit there are for the most part intresting even though my group found the encounters here quite easy. If you can somehow draw a bigger part of the cathedral it can give players a nice scale of this places size. There's also some nice monsters in the bestiary to use. All in all this is and alright part in this AP but there isn't anything special that would raise it above others. Also in this part we continue with find the map/journal about the next place plot device which just gets old. A nice little starting crypt. A lot of very diverse and fun encounters in inspirative locations with cool monsters. A big but not too big and uncomplicated to draw showdown location. Useful magic items that make sense. The Mindspin Mountains Gazetteer adds nothing new to what can be found in the "Campaign Setting: Belkzen - Hold of the Orc Horde" book. Also the map is very small and shows few locations. You absolutely have to buy the "Giantslayer Map Folio" which is beautiful but costs an additional $19.99. As always Tim Hitchcock delivers - the different encounters are very entertaining and masterfully executed. Announced! Cover image and description are not final and subject to change. I like the idea of going to legendary giantslayer's tomb. I hope this will have a writeup on Minderhal as well as rules for various Deific Obediences. Call me crazy, and I know I've said this before, but the gods of old Thassilon, Lissala and Minderhal, didn't seem abjectly evil. Rather, it seemed as though their faiths were perverted over time. I'd love to see some sort of writeup on that. You know I'm someone who has grown tired of standard sword and sorcery fantasy and I thought that every AP after Iron Gods was only for lowly commoner babbies who can't appreciate having cyborgs, laser guns and aliens with their dragons, dwarves and magical swords. But the more I hear about this AP the more I'm finding myself becoming more and more in the mindset of a lowly commoner babby, throw away my laser guns and cyberarms forever, and buy this! A Jotunn R. Lee Ermey... now that is a brutally scary prospect! YES! Minderhal for the win! Who is the artist doing these giants ? Jesper Ejsing is doing all of the covers for Giantslayer. I noticed today that in each issue, the Pathfinder's Journal is written by a different author. That raises some questions for me. 1: Is this the new format for the Pathfinder's Journal? Or are you trying out something new? 2: Is it one novella with multiple authors (like Prodigal Sons) or 6 separate short stories that relate to the issue at hand? We've done previous Journals that had a different author for each of the six parts, but in those cases it was all following along the same narrative. This time around I wanted to try something a little different. This time in the Journal, there are six protagonists that are adventuring together, and they are about to raid a giant's lair and it's looking grim. So they decide to tell each other about their greatest giant hunting tale as a way to bolster their courage. So, you get six different stories by six different authors that are somewhat tied together. I hope people like it! What are the 4 new monsters? I haven't received my notification of shipping yet. And in the adventure - does the group really has to sneak or can they fight their way through? There probably is a map of the mindspin mountains we will get in big in the Giantslayer map folio - what does it show? Have not read the adventure good enough to answer if the pc's can fight or stealth your way through. 1)What is Minderhal like? and where is his realm? 2)what is Great Elder Iuu like? Why wasn't the Valley of Minderhal and Nargrym Steelhand’s Tomb aren't listed on the map of the Mindspin Mountains? As it is, there's no real way to pinpoint their location. Would've been useful. I don´t have this book yet but the later location should absolutely be on the map and you are right to point that out. Is the tomb of Nargrym Steelhand even in the Mindspin Mountains? Is the Kingdom of Kragnaroth shown? What is a mongrel giant? They're both in the Mindspin Mountains, but their locations are only given as "about 90 miles southwest and Trunau" and "about 40 miles southeast of the tomb," respectively. The adventure doesn't contain a map of the mountains, primarily because the PCs are traveling to different locations in the mountains throughout the entire AP, and that would necessitate reprinting essentially the same map over and over again in each adventure. Since the actual travel between locations is not part of the adventures, we chose to not include such a map and instead use that space for adventure content. The Giantslayer Poster Map Folio allowed us to do a map of the entire Mindspin Mountain range that includes most of the major adventure locations from the AP. A template that can be applied to giants. The resulting creature has a mixed giant bloodline, and has traits from one of the following: ash giant, cloud, fire, frost, stone, or taiga. It's either a +0 or +1 challenge rating, depending on whether the base giant's size category increases. Minderhal is lawful evil, with more emphasis on lawful than evil. Very staunch traditionalist, he's also a little bitter that stone giants have stopped worshiping him in droves. He's too rigidly-minded to realize that it's his own unyielding nature that drove his people to other gods. Some Kellids worship him as well. He lives in a large mountain range adjacent to Hell. Iuu is a really interesting, nuanced character. Probably my favorite herald yet. Like Minderhal, he's seriously lawfully with a side of evil, and all about teaching and promoting tradition. He'll never leave a comrade behind if he can help it. He was one of the first stone giants and can throw a mean chunk of adamantine. Does Minderhal have a divine obedience by any chance? Spend an hour working a piece of stone into a tool or weapon by hand, while chanting from a holy text, to get a +1 bonus to strength checks and attack rolls with thrown weapons. So it's a template to use for when, say, a Cloud Giant and Frost Giant end up loving each other very much? Living Cave Painting, sounds really interesting and awesome. not a fan of the other 3. Why are not all sites included on the MM´s map? What is the reason for not including the fire giant kingdom of Kragnaroth (Pathfinder Campaign Setting: Belkzen, Hold of the Orc Hordes pages 48 and 49) or other sites? Also i would expect that the Mindspin Mountains gazetteer in this volume has at least a rough map of the region to which can be refered to throughout the adventures. That's pretty cool, I always wondered about that myself. Like would the kids just be one or the other, or some mangled mix? (Which would give a great explanation as to why giants do not normally mate outside their own). I wonder if there is a way to extrapolate it to include other giants than the ones listed? I'll have to take a look at it myself when it comes out. If you have the final Shattered Star adventure, the living cave painting is a much weaker version of the living rune. Basically, 2-dimensional aberration with weird powers. Also i would expect that the Mindspin Mountains gazetteer in this volume has at least a rough map of the region to which can be referred to throughout the adventures. Marco, I have the PDF of Chapter Three open that specific article and I'm staring right at a map like you're describing. I mean there is literally a rough, but fairly detailed map of of the Mindspin Mountains. I am counting 17 different cities, ruins, dungeons, and places of interest. I am seeing a number of adventure sites on that map that appear in Pathfinder Campaign Setting: Belkzen, Hold of the Orc Hordes, including Kragnaroth the other fire giant kingdom. Which makes sense, because the Developer of the Belkzen Campaign book is also the author of the Mindspin Mountain article (Mark Moreland). I'm not trying to be argumentative or disrespectful, but the AP Team (freelancers and Developers) have to husband our resources carefully. There are limits to what we can provide within our page count. Authors are limited on word count. Part of that is so we have room for maps and artwork. Everything has to be carefully balanced. We add extra words, we might lose some art or maps. Too many maps or art and we have to lose words. So, getting back to Rob's earlier post, I believe we've provided the maps necessary to run the AP. The Map Folio does expand the details on the map and incorporate other products. Remember, if we rely too much on another campaign sourcebook, we run the risk of giving folks the impression they HAVE to buy another book—which simply isn't true. I just did not understand that Kragnaroth is not shown on the big map of the Mindspin Mountains in the Giantslayer map folio but that is not your fault. Thanx again for your detailed response - i´m looking forward to your maps.